It's the first such deal between a major U.S. sports league and a casino. NEW YORK — The NBA and WNBA will now share official data with MGM Resorts International, a major win for the leagues as they prepare for the anticipated growth of sports betting across the country. The Las Vegas-based casino giant will pay the NBA for that data to use in determining outcomes of various bets. 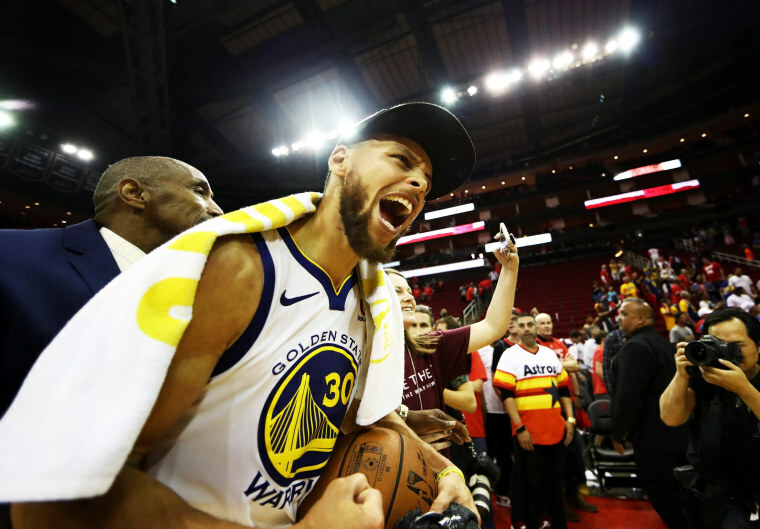 The NBA's stance has been that getting accurate stats to bettors is critical so players know what they're betting on and so casinos will know when to pay out, and MGM Resorts is the first casino to make an arrangement with the league for those numbers. Terms of the deal announced Tuesday were not disclosed, other than it's a multiyear arrangement. "I know the value of data," MGM chairman and CEO James Murren said. "To be able to have the official NBA data for sports bettors around the world is very valuable. I was willing to, and I've paid for that." NBA Commissioner Adam Silver, who has been talking with Murren about such an arrangement for weeks, said the leagues believe they're getting adequately compensated for the data. "It's a leap of faith on both sides," Silver said. "It's a deal moderate in length where I think we can both step back and assess as we go and see, 'Is it working? Is this deal fair? Are we providing the consumers with the right type of experience?'" "We understood the value of our marks, of official designations," Silver said. "But I think then in terms of the data we're providing, we have a sense of the magnitude of the current business and a sense of where things may go over the next few years. And I'd say we generally tried to approximate in a sense to come up with what we thought was fair compensation." How MGM will get that data remains unclear. NBA stat data is distributed globally by Sportradar, which sends it to media outlets, broadcasters and betting outlets outside the U.S. — but not inside this country, at least for now. With the start of preseason games still about two months away, there's plenty of time for those matters to get worked out. "What this relationship entails is access to official data for the many casinos that MGM operates," Silver said. "It's the use of the NBA's intellectual property and as we've discussed before we're very focused on integrity provisions to protect our fans, to protect those who choose to engage and bet on the NBA." MGM will be an official casino partner for the league, but will not have exclusive rights to the data. The NBA still can, and likely will, try to make deals with other casinos who will be offering sports betting in various states or through mobile apps. The deal also won't stop other casino companies from offering wagers on NBA games, including prop bets that rely on results other than the final score. MGM and other casino operators are moving aggressively to be able to capitalize on the U.S. sports betting market, which is expanding after the Supreme Court ruled in May that states could take sports bets if they wanted. MGM has made three significant deals this week to expand its sports betting operations. The company, which is scheduled to report second quarter earnings Thursday, announced separate agreements with a European bookmaker and a U.S.-based regional casino operator that will give it technological expertise and market access in several states where it doesn't already operate casino-resorts. The joint venture with the United Kingdom-based owner of Ladbrokes, GVC Holdings, will lead to the creation of a sports betting and online gambling platform in the U.S. with a mobile app and website featuring odds and highlights. Murren has previously expressed support for the leagues benefitting from the newly created market, but for the "integrity fee" as pushed by Silver and the NBA as well as other leagues. "I'm not a fan of that name, and I don't have any idea what the economic proposition would be, but in so many cases there are opportunities, and this is on a going forth basis," he told The Associated Press hours after the Supreme Court issued its ruling in May. The deal announced Tuesday also calls for cross-promotion: MGM will be advertised on NBA assets like NBA TV, NBA.com, the NBA App and social media platforms. In turn, MGM will promote the NBA on its betting platforms. The NBA and MGM have been in business together before now. MGM owns the WNBA's Las Vegas Aces, who play inside the Mandalay Bay casino, and is also a presenter of the NBA Summer League. "This is a whole new world for us," Silver said.